On Saturday, one car was chasing after us for 10 min. My husband and I were wondering what was going on. When we stopped at the traffic light in the city, my husband realized that people in the car behind us were out Mexican workers! We both pulled over. Suddenly, they handed the gift bag to us and said "Merry Christmas!" 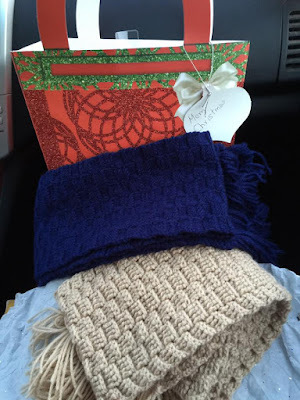 There were some local nuts & dry fruit, homemade tamales and handmade scarves! This almost made me cry. My own family is far away in Japan, but someone else in America treats me as a family. Beautiful Christmas spirit I experienced today. Ehime: "I want to play with you doing wrestle on Christmas day." Kona: "I'm going to wrestle now♪"
For mommy who was got a hand-knitted stuff the last time was when she was 4 years old, please click the puppy photo on the right above or a dog picture below to vote for a doggie blog ranking. Thank you!